We’re excited to announce that since launching our Plant a Tree campaign back in February, over 9,400 residents living at ResidentUtility properties have opted out of paper invoices! These efforts have resulted in 9,400 trees being planted around the world due to our partnership with One Tree Planted. While we’re quickly approaching our goal of planting 10,000 trees, we’d love to keep the momentum going throughout the entire year! For more information on the Plant a Tree campaign, including how to get your properties involved, read the below article. For access to sample posts to share on your property’s social media page, email us at ResidentUtility@entrata.com. Entrata’s ResidentUtility customers have a new way to help plant some roots in their communities and go green. 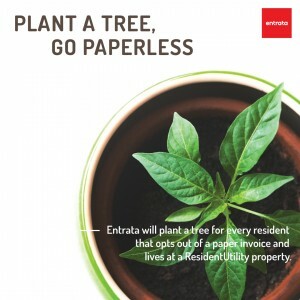 In an effort to encourage residents to go paperless, Entrata will plant a tree for every resident living at a ResidentUtility property who opts out of receiving a paper invoice. We have partnered with One Tree Planted, a non-profit charity who plants trees around the globe, to help make this program a reality. Based in Vermont, One Tree Planted partners with and provides financial support to organizations around the world to help sustain and promote the reforestation process. With an ambitious goal to plant 10,000 trees this year, we look forward to seeing the campaign grow. Encourage your residents to make a difference by going paperless today! Whether a resident is receiving a paper invoice or they opt out and only receive an emailed invoice, both the resident and the property can realize huge benefits through ResidentUtility’s convergent bill. This convergent bill, which contains all lease and utility charges, provides a fast and easy way for residents to make a single payment through Entrata’s ResidentPortal. A variety of benefits can be realized when properties move from traditional non-convergent billing to convergent billing. Entrata’s ResidentUtility is built to make this process simple and easy for everyone. Providing a streamlined experience, ResidentUtility’s convergent billing and collection system accelerates property cash flow, cuts expenses and generates new ancillary revenue. Take a closer look at ResidentUtility to see how it can make a difference at your property and encourage residents to go paperless. Entrata’s ResidentUtility customers have a new way to help plant some roots in their communities and go green.